Margins for pharmaceutical products – which had already been dropping in the last decade – are being driven down even further by international reference pricing, the practice of using the price of a product in other countries to set or negotiate the reimbursable price of a product in a given country. 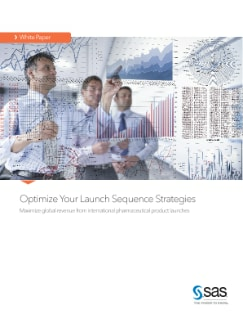 For pharmaceutical companies, a misstep in setting prices or choosing the launch sequence can be costly, both during the critical launch period and in market. The SAS® solution for launch revenue optimization enables global pricing teams to proactively simulate and optimize launch timing and pricing decisions based on the predicted effect on global revenue – while accounting for the complex web of international reference pricing and country-specific rules.